Keep ‘em Safe, Wear ‘em Proud! – Hearing aids tend to whistle whenever a baby’s head leans against something – which happens a lot when young babies are cuddled and when they sit in car seats, strollers, swings, etc. – If babies spit up a lot while they are laying on their back, it tends to run into their hearing equipment. – It can be tricky to find a hat that keeps the baby’s head warm, keeps the hearing aids dry, but does not make the hearing aids whistle. – As babies get older, they like to put everything in their mouth – including their hearing equipment! – When babies get to be toddlers, they think ripping off hearing aids and throwing them is a super fun game! So if you are also finding it tricky to keep hearing equipment on your baby, toddler or preschooler – YOU ARE NOT ALONE!! Wig tape can be really helpful for keeping hearing aids or cochlear implants in place on tiny ears, especially if they are flopping around. You can usually buy it at any store that sells wigs, or you can order it online, a quick google search pulls up various sellers. “3M Surgical Tape” is recommended for hearing aids and is of just the right size and strength and is latex-free. There are many products out there designed to keep hearing aids on. You may have to experiment and try a few before you find what works best for your child. Your service provider or audiologist might be able to request free samples for you to try. You can try the following sites, or search for “hearing aid retention” on Google. 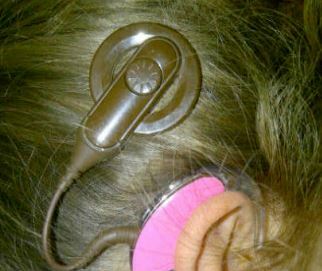 Ear Gear (www.gearforears.com) – colourful water-resistant covers which can be attached to clothing with a clip. These are made in BC. Huggies (https://adcohearing.com/product/huggie-aids-view-select-sizewww.huggieaids.com) – can stop the aids from flipping off of the child’s ears, so they are less distracting and the child is less likely to yank them off. Critter Clips (https://adcohearing.com/categories/clips-and-loss-prevention) – a lightweight lanyard attaches to the hearing aid and clips to the child’s clothing with a colourful clip (also Dino Clips and Sea Clips). Otoclips (https://adcohearing.com/categories/otoclips) – plain clips and cords designed to attach hearing aids to clothing. SafeNSound security straps (www.getsafensound.com) – these fit snugly to the head and are hard for babies to reach; they can also work with glasses and they have one that connects to a hair barrette. There are also some home-made options for keeping hearing aids attached to clothing. You can use dental floss or fishing line to connect the hearing aids and pin it to the back of the shirt. Pacifier clips can sometimes work or those cords that are meant to keep on eyeglasses – you can fit the flexible loop at the end around the hearing aid and pin the centre of the cord to the collar of the shirt. Silkawear Bonnets (www.silkawear.com) – unique and custom-made bonnets for young children who wear hearing equipment. Monkey Gear (www.monkeygear.ca) – hats and bonnets designed to help keep on hearing equipment – one of these has a brim for summertime. Hanna Andersson (www.hannaandersson.com) – they sell lightweight hats that fit snugly on the head and are thin enough not to block sounds coming in. They are often tied under the chin. 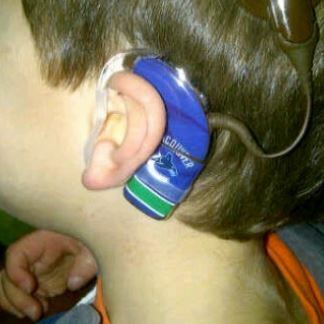 One of our BC parents has developed her own product, a headband to help keep on cochlear implants (see article insert on “Gina’s Brilliant Bionic Headbands”). Skinits (www.skinit.com) – vinyl stickers specially shaped to fit on cochlear implants and are easily removable without residue. Countless designs available. Hayleigh’s “Cherished Charms” are another decorative product, designed by a 12-year-old girl who wants to help kids and adults to be proud of their hearing aids (www.hayleighscherishedcharms.com). A less conventional idea I heard recently was to use inflatable swimming arm bands. They can be decorated with stickers or felts markers and apparently prevent a toddler from reaching his or her ears to pull the hearing aids off. This was also suggested as a strategy for making earmold impressions in the audiologist’s office. Someone also suggested bandaids for keeping cochlear implants on during activities such as tumbling, and using a Bounce sheet inside a touque to prevent static electricity building up (also for CI’s). Distraction, positive reinforcement and rewards are very useful parenting tools. Distraction can be one of the best strategies for babies and toddlers. Many parents find it works to give the child something to keep their hands busy when they are first putting in the hearing aids. This might mean having some special toys that only come out when the hearing aids first go on or a special game that you play. Unfortunately, as parents we do not always have time to entertain our baby every waking minute, but often young children will forget about the hearing aids in their ears if they’ve been distracted by something else. And for the child who is a little older and understands the concept of a reward, you can always try candy, raisins, stickers and little dollar store toys as incentives for keeping the hearing aids on. Of course that also means finding a way to wean your child off of the incentives later, as the dentists of the world would probably frown on the idea of bribing our children with candy every time we put the hearing aids on!! So if you are struggling to keep hearing equipment on your child, we hope some of these tips might be helpful. Also, we hope you realize that you are not alone in this struggle. Many parents find this challenging, but it does get easier eventually! Every child is different, but by the time our son was two, he would not let us take off his hearing aids until after he had fallen asleep at night. One last thing to keep in mind – it is always a good idea to check in with your audiologist regularly, particularly if your child is refusing to wear the hearing equipment or is responding differently than he or she has responded in the past. It’s important to make sure the earmold or hearing aid isn’t rubbing and making a sore spot and that your child doesn’t have an ear infection. The audiologist can check to make sure that the earmold is fitting correctly (babies grow out of earmolds very quickly), that the hearing aid is working properly (children will sometimes pull off a hearing aid or implant that has a dead battery or is not functioning well), and that the hearing equipment is set correctly. Lastly, we encourage you to talk to other parents. Come out to a BC Hands & Voices event, call your Parent Guide, ask to meet other parents through your early intervention agency or drop us a line on Facebook or by email. We can be such a great resource for one another! This entry was posted in Articles, Babies, Families to Families, Newsletters and tagged babies, hearing aids, hearing equipment, keeping hearing aids on, wig tape. Bookmark the permalink. Follow any comments here with the RSS feed for this post.